Zip Lining with bus transfer from hotels or guest houses in Castries and the north of the island to Treetop Adventure Park and back. 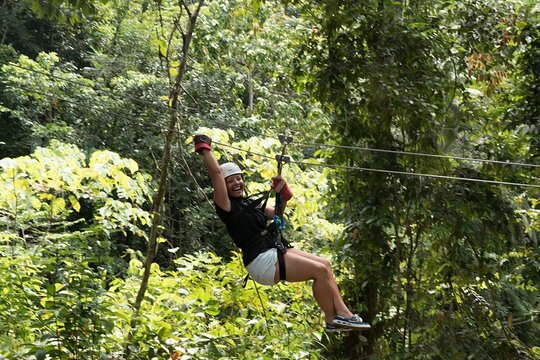 Zip Lining with bus transfer from hotels or guest houses in Marigot Bay to Treetop Adventure Park and back. After morning pickup, your tour begins with an air-conditioned bus ride along the east coast of St. Lucia to Treetop Adventure Park. During the journey, your guide provides information and entertainment and then helps you check in when you arrive at the site. Hydrate for your ziplining experience with provided juice and bottled water (other drinks available at your own expense), and then head to the preparation area to be outfitted with your harness, helmet, and gloves and receive a safety briefing. 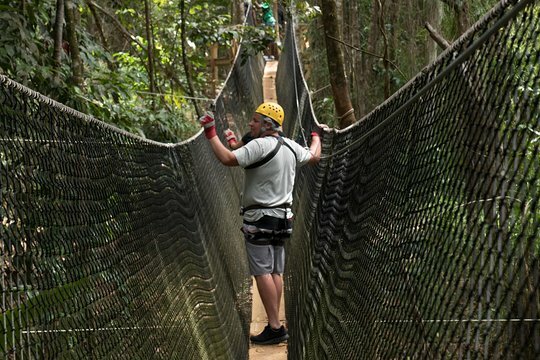 When everyone is ready, head to the course to start your exploration of the rain forest via 12 ziplines, 20 platforms, one net bridge, and four hiking trails. There is staff on each platform to help you, if needed. The course takes about one hour to complete, after which you'll return to the prep area to remove your equipment. Enjoy a short break to relax and take in the lush environment, and then board the bus for the ride back to your pickup location, stopping once along the way for a photo op. I must say we had a great time altho we were scared out of our minds lol and had fun will definatley do this again. Our tour guides were very pleasant and also had fun with us. A great afternoon even in the torrential rain! Get quick answers from Treetop Adventure Park Canopy Tour staff and past visitors. Hi. The reviews sound great and I want to take part, however I'm a bit nervous. 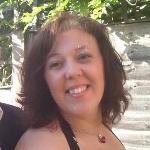 I have average fitness, am overweight and heading towards 50! Is this suitable for larger people? Do you have to participate in all of the ziplines or can you miss any out if frightened? Thank you for any reassuring responses or advice. Definitely do it! I fit in your category but just over 60! We have done these zip lines 3x & every time has been wonderful, the guides will make you feel very safe & you won't want to miss any of the zip lines. You will be in very good hands with Tree Top.